NSF International, formerly the National Sanitation Foundation, is tasked with providing accredited third-party certification of water fluoridation chemicals to insure that they comply with the technical requirements of NSF/ANSI Standard 60. The Mosaic Company “is the world’s leading producer and marketer of concentrated phosphate and potash…[mining] phosphate rock from nearly 200,000 acres of Mosaic-owned land in Central Florida, and…four mines in North America, primarily in Saskatchewan.” Not incidentally, Mosaic is also one of the world’s largest suppliers of a byproduct (formerly a waste product) of phosphate fertilizer manufacture, NSF/ANSI certified Hydrofluorosilicic Acid (FSA or HFS) for water fluoridation. 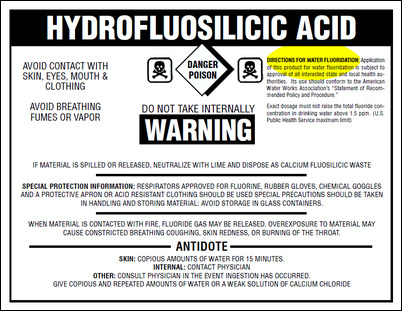 Read and download NSF Fact Sheet on Fluoridation Chemicals (PDF), the standard reference (2013). Read and download other documents on fluoridation additives, and the toxic contaminants most commonly found in association with them, at Water Fluoridation Chemicals. 1963 NSF opens regional offices. 1965 Plastics Piping and Wastewater Treatment Programs start. 1967 NSF Testing Laboratories becomes a not-for-profit corporation. 1984 Bottled Water Program starts; Health Advisory Board is established. 1985 As with the Water Treatment and Distribution Systems Program (1980), in an era of wholesale government privatization, the NSF Drinking Water Additives Program starts with a cooperative agreement from the U.S. EPA. 1996 NSF is selected as a Collaborating Centre on Drinking Water Safety and Treatment by the World Health Organization (WHO). NOTE: To understand some of NSF’s size and reach, see the full NSF Timeline. As a public service, complimentary copies of NSF standards are available to regulators only and may be requested by completing our general inquiry form. Only one NSF standard may be requested per submission. The requester must attest that they are an active member of the federal, state or local regulatory community. The request must also agree not to share or distribute these copyrighted standards outside of their agency.